Yeshialem Endalew, 24, a teacher in rural Ethiopia, traveled more than 100 kilometers to Dangila Primary Hospital to have her first baby by cesarean delivery. For almost seven years in the 1980s, I lived on Mali’s Dogon Plateau. I was a Peace Corps volunteer focused on primary health care and spent most of my time with women. I learned about their joys, sorrows, dreams, struggles and, surprisingly, their great fear of childbirth. As a young, single American woman, I thought of birth as natural, safe and joyous. Nothing had prepared me for the death of Yabara, a 27-year-old pregnant woman in my village. Like many rural Malian girls, she had married early, during her teens. She had six children at home and was pregnant with her seventh child when she died from obstructed labor. The complication is easily treated by cesarean delivery, but in this rural village, without access to surgery, it was—and still is—a death sentence. The memory of Yabara dying while giving life pains me. Even more unacceptable is the fact that today—more than three decades later—vulnerable women and poor mothers living in rural areas and urban slums throughout sub-Saharan Africa still can’t get lifesaving surgery. They don’t have access to cesarean delivery—a common surgery needed by up to 10 to 15 percent of laboring women, according to the World Health Organization (WHO). This healthy, newborn boy is now home from Dangila Primary Hospital in northwest Ethiopia with his mother, Yeshialem Endalew. Both the mother’s and baby’s lives depended on access to a safe cesarean delivery. An appalling 99 percent of maternal deaths occur in low- and middle-income countries. It’s no coincidence that this grim statistic aligns with regions where unmet need for surgery is greatest: in eastern, western and central sub-Saharan Africa, and south Asia. In fact, a woman in sub-Saharan Africa is 175 times more likely to die during childbirth than a woman in a high-income country. When a woman is in labor, complications can be exacerbated by the long distances she may have to travel to reach a health facility and the conditions she finds upon arrival. At our health clinic in Mali, we provided care for normal deliveries, but, like so many places on the continent, we lacked running water, electricity and basic medical supplies. There was no skilled provider within 50 kilometers able to provide cesarean delivery and other elements of emergency obstetric and newborn care. But I have real hope that Yabara’s granddaughters’ generation will not need to fear dying in childbirth. At the U.N. General Assembly meeting in New York this week, maternal and newborn health-related Sustainable Development Goals are high on the agenda. This is the year for global and country leaders to take critical steps to ensure that all women everywhere have access to cesarean delivery. If we are going to achieve the global goal of reducing the maternal mortality ratio to less than 70 per 100,000 live births, we need to reach more people faster and more affordably with innovative approaches. On the global front, the newly elected WHO Director-General Tedros Adhanom Ghebreyesus is providing tremendous leadership to reduce health disparities and has prioritized universal health coverage Given Tedros’ former position as Ethiopia’s minister of foreign affairs and minister of health, it’s not surprising that his country has emerged as a leader in tackling reproductive, maternal and newborn health. More than 3 million births a year take place here, the majority in rural areas. To ensure comprehensive emergency obstetric care, the government developed a pioneering national plan for safe surgery that is rolling out nationwide. 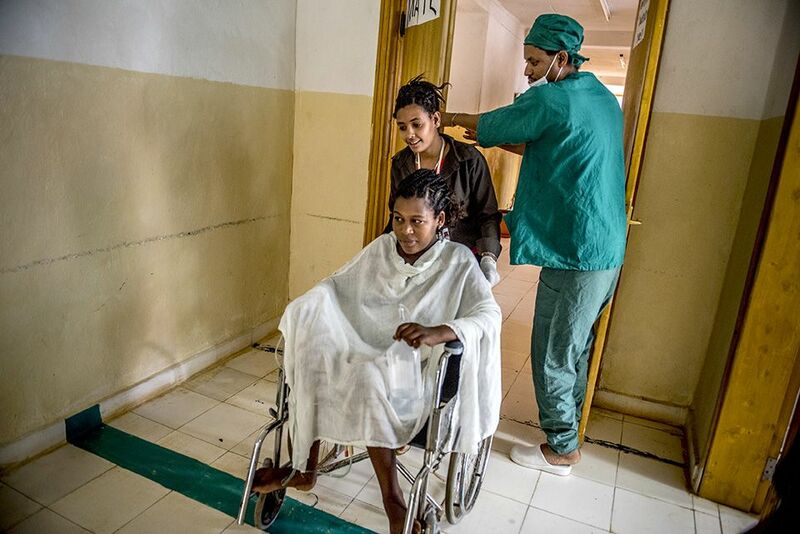 Lemlem Karl Hospital in the Tigray region of Ethiopia is among the health facilities working to reimagine surgical services to increase access and improve care. Dr. Tesfaye Abraham (center), a general surgeon, performs a knee operation. He is helping lead the hospital’s safe surgery initiative. Ethiopia’s ministry of health is embracing a radical rethinking of surgery’s conventional doc-at-the-helm arrangement. 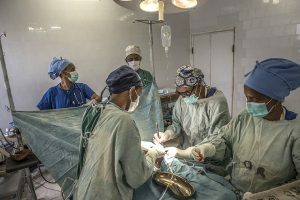 In districts where there are no surgeons, they are investing in nonspecialist surgical care providers—health care workers like nurses, clinical officers, general practitioners and midwives who are already on the job. They aren’t specialized surgeons but can be trained to work as teams to perform certain emergency procedures in their community facilities; notably, cesarean delivery. These teams in the trenches are well-positioned to step up and take the lead on cesarean delivery, relieving the burden from the limited number of surgeons, who work primarily in cities. A key to Ethiopia’s success in rolling out this initiative is its fostering of relationships between health workers in rural facilities and mentor-specialist surgeons in urban hospitals. Surgeons are seeing firsthand that if everyone focuses on patient care, task sharing and problem solving, nonspecialist surgical teams can save lives. In the past, countries and funders overlooked cesarean delivery and other surgeries as solutions to reduce maternal and newborn death. The global and country data highlight tremendous gains in reducing major killers during pregnancy, such as postpartum hemorrhage and pre-eclampsia. To prevent even more needless deaths, we need to refocus our attention over the next five years on the surgical aspect of emergency obstetric and newborn care. Make no mistake: The global movement to make this happen is underway. With partners like the Global Alliance for Surgical, Obstetric, Trauma, and Anaesthesia Care; Safe Surgery 2020; the United States Agency for International Development’s priority of ending preventable child and maternal deaths; and the U.N. Commission’s Every Women Every Child movement, the question for others is: Will you join us to accelerate progress? 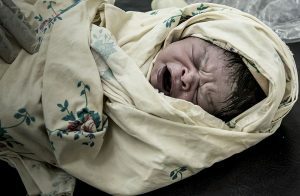 When women like Yabara die giving birth due to lack of surgery, the global health and development communities must insist that not only are these deaths preventable, but also that a new surgical ecosystem being modeled in Ethiopia and elsewhere offers a uniquely creative solution—one that works well and works now. An investment in safe surgery is an investment in women, and an investment in women benefits families, communities and nations. Monica Kerrigan is Jhpiego’s Vice President of Innovations. Innovations Program Officer Shannon Egan contributed to this commentary, which originally appeared in The Lily.